The world of bamboo is vast and fascinating. With so many varieties, so many uses, and so much to know about this remarkable plant, we never seem to run out of questions, myths and misconceptions. So let’s cut to the chase and answer 12 of the most common questions about bamboo that we hear all the time from our readers and customers. 1. Why is bamboo called a grass? Botanists classify bamboo as a grass because of its perennial, flowering, monocotyledonous growth habit. Like all grasses, bamboo has stems that are mostly hollow except at the nodes, and grows with leaves that form a sheath around the stem. The grass family, Poaceae, includes about 12,000 species, with approximately 1,500 species of bamboo belonging to more than 100 different genera. 2. Which bamboo is non-invasive and easy to contain? Most bamboos propagate themselves with underground roots called rhizomes. We call these types of bamboo “runners” because of how the rhizomes spread quickly and aggressively. Other varieties of bamboo have a more compact growth habit and we call them “clumpers”. Most species of the Bambusa genus are clumpers, including the very popular Oldhami. Alphonse Karr is another popular clumper. For more suggestions, check out this article on the 10 Best bamboos for your garden. We also have an article on How to contain and control your bamboo, because even the clumping varieties will spread over time. 3. Which bamboo grows the fastest and tallest? Bamboo is famous, in some cases infamous, for how fast it grows. Some varieties can grow up to two feet a day, but that’s under optimal conditions (usually in the tropics) and only during the new growth season. The genus Phyllostachys includes some of the most vigorous species of running bamboo. The tallest and thickest varieties of bamboo are generally referred to as timber bamboo; some are runners and some clumpers. Phyllostachys vivax and Olhami are among the most popular timber bamboo. Again, check out our article on the 10 Best bamboos for your garden. 4. What species of bamboo is Lucky Bamboo? Sorry to burst your bamboo-loving bubble, but Lucky Bamboo is not actually a bamboo at all. Rather, it is a species of the temperate houseplant, Dracaena. But don’t fret, almost all varieties of bamboo are lucky by their very nature! You can read our article on Dracaena sanderiana for more details. 5. Will bamboo grow in Canada and cold climates? Good news! Even if you live in Canada, Minnesota or the heights of the Rocky Mountains, you can find an assortment of cold hardy bamboo species that will thrive in your area. The most cold hardy varieties belong to the genus Phyllostachys (mostly runners) or the genus Fargesia (mostly clumpers). Definitely take a look at our article on the Best cold hardy bamboos. You can check your local nursery, or you may want to order specific varieties of bamboo online. 6. Will bamboo grow indoors? 7. Why is bamboo eco-friendly? Bamboo’s incredible rate of growth and self-propagation makes it an incredibly renewable and sustainable resource. And its versatility makes it an ideal substitute for timber, cotton, even steel. Unlike most crops, bamboo grows naturally in dense “mono-crop” settings without the need for pesticides and fertilizers. Furthermore, an area of bamboo can produce 35 percent more oxygen than the same area of trees, making it an excellent remedy for carbon pollution. 8. Can you eat bamboo? Absolutely. Asians have been enjoying the nutritional benefits of fresh bamboo shoots for thousands of years. Not every species of bamboo has tasty shoots, but a few of the more popular edible varieties are Bambusa oldhamii, Phyllostachys edulis, and Phyllostachys bambusoides. To learn more about the history and nutrition of eating bamboo, you can read our article on Edible bamboo shoots. 9. What kind of bamboo do pandas eat? There are roughly 40 different species of bamboo that make up the diet of the giant panda bear. None of these includes Moso bamboo, which is the Chinese variety used most widely for commercial purposes, including bamboo clothing and bamboo flooring. 10. When does bamboo flower? Different species of bamboo have different flowering schedules, which can vary dramatically. Many varieties only flower once every hundred years or so. Interestingly, in many cases, almost every specimen of given species, anywhere in the world, will flower at the same time when the blooming cycle comes around. In some cases, the bamboo will die after flowering. Because bamboo typically propagates itself by spreading its roots, the flowering is not so important for survival the way it is in other plants. 11. Can you grow bamboo from seeds? Bamboo can be grown from seed, although it’s not the standard practice. It’s much easier to propagate bamboo by taking root cuttings and dividing established clumps. To grow bamboo from seed is more of a novelty for real bamboo and botany enthusiasts. Growing from seed can result in a slightly different strain, rather than the identical copy you get from a cutting. 12. What’s so great about bamboo clothing? Bamboo has gained increased attention in recent years with the advent of bamboo clothing and textiles. The benefits of bamboo clothing are almost too numerable to list. To begin with, bamboo’s tenacious growth habit makes it incredibly renewable and sustainable. As mentioned above, bamboo grows quickly, requires no pesticides and herbicides, and needs no replanting after harvesting. This is in sharp contract to conventional cotton which is extremely pesticide intensive. In addition to the ecological advantages of bamboo, anyone can easily feel the difference when they handle a luxuriously soft bamboo t-shirt or bamboo bath towel. Not only is bamboo fabric soft, but it has antimicrobial properties that make it hypoallergenic and resistant to odors. You will also discover the temperature regulating qualities when you wear a bamboo shirt or sleep on a set of bamboo sheets — warm in the winter, cool in the summer! So you’re in love with bamboo, and you just can’t get enough of it? Welcome to the club. My name is Fred and I’m a bambooholic. That’s right. Without my regular fix of noble bamboo grasses, I get terribly wound up. When the monotony of ordinary life brings me down, or a particularly grueling day at the office leaves me on edge, there’s only one thing to bring me back to center. That’s right, there’s nothing so calm and balancing as a quiet stroll through a majestic grove of bamboo. And when that’s not available, an inconspicuous seat among a few clusters of potted bamboo will do just fine. If I could, I’d travel the world to visit all the greatest bamboo forests in the world. And I’d pay a visit to every arboretum and botanical garden with a bamboo collection worth mentioning. Well, unfortunately that hasn’t been possible yet. But in the meantime, I’m keeping a list of the world’s best bamboo gardens, just in case the opportunity arises. DISCLOSURE: Some of the links in this article are affiliate links. This means that, at no additional cost to you, we will earn a small commission if you click through those links and make a purchase. This helps us meet the cost of maintaining our website and producing great articles. Now if you Google “best bamboo garden” — and maybe you already have — you’ll probably get pages and pages of results for Chinese restaurants, all cleverly (if not originally) named Bamboo Garden. Maybe someday we’ll get around to writing reviews for bamboo themed restaurants. But don’t hold your breath. Instead, grab your notepad and your world atlas, because we’re heading on a tour of the world’s greatest bamboo gardens. NOTE: We present following list in no particular order, although the gardens are numbered to make the list easier to scroll. Otherwise we have organized the list by continent, beginning with Asia, which not surprisingly lays claim to the greatest number of incredible bamboo gardens, especially in Japan. In a city teeming with monuments of historic and cultural significance, the Arashiyama Bamboo Grove of Kyoto — also called the Sagano Bamboo Forest — adds yet another rich layer of texture to this glorious metropolis. A natural forest of sprawling, towering bamboo, the Japanese Ministry of Environment manages the grove as a tourist attraction and natural reserve. There are several trails leading through the park, where visitors can feel themselves being swallowed up by the massive grasses. Once upon you could come here and meditate to the sound of rustling leaves and clonking bamboo poles, but today the forest has risen to the status of world-class, must-see destinations, so don’t expect to have the place all to yourself. A peaceful botanical garden with a naturally flowing spring and some 2000 thriving shoots of bamboo, Chikurin Park is located close to the train station and charges no entrance fee. If you’re looking for an oasis of bamboo in a quiet suburb of Tokyo, this densely wooded grove is well worth a visit. A Zen Buddhist temple dating back to the 14th century, Hokoku-ji is often referred to as the Bamboo Temple. Amidst the various structures, all beautiful specimens of Japanese architecture, you’ll find of grove of about 2000 Moso bamboo poles. If you want to take in a genuine Zen experience with your bamboo, this is the destination. Though not one of Japan’s larger bamboo collections, this grove has been established for more than 200 years. The metropolitan park is named after the large species of sparrow (suzume in Japanese) that once overwhelmed the area. Today you’ll still find many of these and other birds among the bamboo, but not in the great quantities of centuries past. You can also visit a traditional and fully restored Japanese house here. Deep in the heart of this central Chinese super-metropolis (population approx. 14 million), Chengdu’s Wangjianglou Park is the ultimate urban hideaway. With charming teahouses and meticulous landscaping that sprawls out for acres and acres, the highlight of this stunning park is arguably its historic and extensive collection of bamboo. Numerous monuments here are dedicated to Xue Tao, a famous Tang dynasty poetess, whose passion for bamboo has been well documented. In her memory, the landscape architects also planted more than 200 species of bamboo, and today they have grown to magnificent size and splendor. One of Beijing’s seven largest parks, with a history tracing back to the 12th century, the Purple Bamboo Garden consists of three lakes and a series of canals and bridges occupying more than 100 acres. The bamboo planting began in the 1500s, during the Ming Dynasty, and today you can find more than 50 species growing on the premises, as well as an assortment of bamboo structures. The park earned its name from the abundance of purple bamboo, but the quantity and diversity of bamboo growing in the park is truly astonishing. The South Korean county of Damyang is well-known for its thriving bamboo forests, and the residents have gone so far to make a tourist attraction out of their prolific bamboo. In addition to the verdant arboretum, the region is also home to a bamboo theme park, a bamboo museum, and a bamboo festival. The arboretum, “Juknokwon”, features some very scenic and well-maintained walking paths and an artificial waterfall. Vietnam’s largest bamboo museum is the essentially the work of a single monk named Thich The Tuong. He started collecting and planting bamboo in this idyllic corner of the country about 10 years ago as a way to preserve and share this vital symbol of Vietnamese heritage. He claims now to have more than a 100 species of bamboo on his property. You can discover an amazing array of treasures — both natural and manmade — throughout the surrounding forests of the Son Tra peninsula. Carolina Gozon Jimenez began this garden in the year 2000 on a 5 hectare (12 acre) plot of land just outside the crowded capital city of Manila. Today the beautifully landscaped acreage features about 45 species of bamboo, both indigenous and exotic. Some very striking bamboo structures also showcase the plant’s impressive potential as a construction material. Most interesting of all may be the Bambusetum, Carolina’s bamboo gene bank, preserving a diversity of bamboo genetics for generations to come. The facility also hosts seminars and events to promote bamboo and environmental stewardship. In any other setting, this bamboo garden would be a highlight in itself, but here in the 40-square-mile national park, the bamboo almost gets lost in the landscape of dramatic rock formations and lush vegetation. A peaceful trail leads through the grove into a place of zen known only to real bamboo aficionados, but that’s only one small facet of this stunning landmark. Come for the bamboo, stay for the spectacular topography! A real Mecca for the most serious bamboo enthusiasts, Colombia’s “Bamboo Paradise” is like a living monument to this astonishing plant. Outside of Asia, Colombians probably make better use of bamboo than any other nationality on earth. An educational facility and agro-tourism destination, the Paradise hosts tours and workshops, and grows some of the most impressive bamboo specimens in the world. Demonstrations provide participants with hands-on experience in planting bamboo and using it for a vast range of purposes, from ecological conservation to construction. Of course, all the buildings on the premises are fashioned from giant timber bamboo. A very popular hike on the island of Oahu — where it’s pretty difficult to walk into the woods and find anything less than sensational — this trail will lead you up the mountain through a lush jungle and a gorgeous bamboo forest before reaching the namesake waterfall. At the bottom of the hill, Lyon Arboretum (formerly Manoa Arboretum) offers plant lovers a spectacle of tropical diversity, brimming with palms, gingers, heliconias, bromeliads, and aroids. Located within the Haleakalā National Park (famous for its 7-mile wide volcanic crater), this 6-mile trail will take you through a massive, wild forest of bamboo that stretches out as far as the eye can see. For such an majestic and expansive forest of bamboo, it’s one of the easiest in the world to reach. Prepare to be mesmerized by the sound of leaves rustling and bamboo canes knocking together. Keep going and you’ll reach a couple of incredible waterfalls, one of them (Makahiku Falls) over 200 feet tall. Technically, bamboo is not native to Hawaii, but then nothing really is, because the terrain was created by volcano eruptions. Everything living on the islands today arrived from elsewhere, by wind, by sea or by bird. Unlike many other bamboo gardens on this list, this one is no walk in the park. I mean that quite literally. To reach this wild bamboo forest, you may have to explore deep into the outback. Although the trail is officially less than three miles, it is recommended only for expert hikers. Bring rugged hiking shoes, and a first aid kit, just in case. Along the way you can expect to see 5 or 6 waterfalls and a plethora of biodiversity. And beware: if you wander too far from the river, you might also expect to get lost in the dense forest of bamboo and jungle! Covering 80 acres on the south shore of Kaua’i, this botanical garden offers one of the most picturesque settings on an exceptionally picturesque island. Among its rich array of tropical wonders, the garden has a glorious grove of golden bamboo. Besides the stunning diversity, this garden emphasizes landscape design, so you don’t have to be a trained botanist to appreciate the meticulous planning and outdoor aesthetics. As we’re based in San Luis Obispo, on California’s Central Coast, I just had to include this “local” favorite, a phenomenal nursery nestled in the coastal hills just south of Santa Cruz. But if you think this is merely a case of provincial favoritism, think again. Bamboo Giant encompasses 38 acres of sprawling runners and clumpers and koi ponds and bamboo pagodas — just big enough to feel lost, without actually getting lost. I’m guessing there are well over a hundred varieties of bamboo on the property, but it’s hard to say. For the most part, the various groves are very well labeled with little markers, which can be very rewarding for more horticulturally curious bamboo lover like myself. But eventually, even I reach the saturation point and lose count. Anyway, if you happen to fall in love with a certain strain of bamboo, you can take some home in a pot, because it’s all for sale. Boasting the largest collection of temperate bamboos in the United States, the Bamboo Garden Nursery occupies more than 20 acres in a beautiful woodland setting, just outside of Portland, Oregon. The garden operates as a nursery, with hundred of varieties of bamboo for sale, but it’s also open to the public. In addition to the outdoor groves, there are numerous greenhouses on the premises. Spend a couple hours and you can expect to see some interesting wildlife among the bamboo as well. Looking for another excuse to visit the south of France? Here it is. (You’re welcome.) About 30 miles northwest of Nimes, the Bambouseraie has been propagating flora and welcoming visitors since 1856. Among this prepossessing collection of oak, gingko, magnolia and more, you’ll soon find that this privately run botanical garden specializes in our favorite grass: bamboo. Today the leafy menagerie includes about 300 varieties, making it one of the most diversified bamboo collections on earth. (Experts put the total number of bamboo species somewhere between 1200 and 2000.) Wander about 80+ acres of bamboo groves and soak up the serenity as you bathe in the glory of this amazing plant. They even have a bamboo hedge labyrinth, so you can truly get lost! Not necessarily one of the most impressive groves of bamboo, no must-see list of botanical gardens would be complete without mentioning the Royal Botanic Garden of Kew, which covers a tremendous 326 acres and calls itself the home of a mind-boggling 8.3 million plant and fungal herbarium specimens. For an enhanced sense of tranquility, the bamboo garden lies hidden in a quiet corner between the lake and the Rhododendron Dell. In addition to the several resplendent stands of bamboo, you’ll also find some prehistoric ginkgo trees and a traditional Japanese farmhouse. Keep an eye out for the local dragonfly population as well. Who would have thought that a world wide tour of bamboo gardens would bring us to the former Soviet state of Georgia? Me neither. It’s probably pretty off-the-beaten-track for most of us, but the Batumi Botanical Garden definitely deserves a spot on the bucket list. I thought I’d been to every great Botanical Garden in Europe, from Lisbon to Bucharest, but here’s a new one. Now if you’re like me, you might think a former Soviet territory would be the last place on earth to find a tropical wonderland. And so, where is Georgia anyway? You may want to consult an atlas, but Georgia is located on the eastern shore of the Black Sea, between Russian and Armenia; it also borders Turkey and Azerbaijan. So is that in Europe or Asia? God only knows. This immense garden covers more than 250 acres of rugged terrain on this remote stretch of subtropical coastline known as the Green Cape of the Black Sea. Open to the public since 1912, a few of the gardens highlights are its majestic, 125-year-old magnolia trees and giant sequoias. Batumi also boasts an incredible diversity of succulents, palms, roses, camellias, citrus, evergreens, and yes, bamboo. An astonishing collection of East Asian plant life comprises about 40 percent of the garden, including some exquisite Japanese gardens and a profusion of bamboo forests. If you’re looking a for a far-flung botanical adventure, this one’s for you! The world’s a big place, and bamboo is notoriously prolific, so I’m sure we’ve missed some significant examples here. A certain corner of Central America? The entire island of Bali perhaps? If you have a favorite bamboo forest or garden that we overlooked, please let us know in the comments section below. FURTHER READING: If you’d like to learn more, take a look at some of our most popular articles about bamboo. Can I grow bamboo in the snow? We hear this question all the time, especially from our friends in Canada. 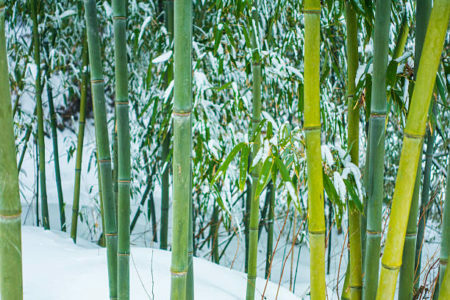 Can I grow bamboo where it snows? The short answer is YES. But the long answer is that it really depends what variety of bamboo you are growing. NOTE: To make shopping easier, this article may include one or two affiliate links. There are more than a thousand species of grass in the bamboo family, and the majority of the most popular bamboos for gardening come from the tropics or subtropics, so they much prefer the warmer climates. But with that many varieties to choose from , you can be sure that a sufficient number of bamboos will grow happily in the snowy mountain regions and far northern latitudes like Canada. In fact, there are dozen of varieties of cold hardy bamboo to consider. Most of them belong to either the Phyllostachys or the Fargesia group (genus) of bamboo. Phyllostachys is one of the most prevalent genera of bamboo, primarily native to China and including about 50 distinct species. Almost every species of Phyllostachys is a fast spreading runner (with an aggressive rhizome root system), and many of them are cold hardy, down to -5 or 10º F.
Fargesia is another major genus of bamboo, also indigenous to China and southeast Asia. Unlike Phyllostachys, the Fargesia bamboos are chiefly dense growing clumpers. This and their cold hardiness have made many varieties of Fargesia very popular among gardeners. Cold hardy runners Phyllostachys aureosulcata: The “yellow groove bamboo” is easily recognizable for the yellow stripe that’s visible on the dark green culms. A subspecies known as “crookstem bamboo” has shoots that sometimes grow in a zig-zag manner. This visually interesting and attractive variety can grow up to nearly 50 feet in height, even in freezing temperatures. But in zones were it regularly gets below -10 or 15º F, it probably won’t grow more than 10 feet tall. Phyllostachys heteroclada f. solida: This subspecies of “water bamboo” is commonly known as “solid bamboo”. It’s one of the few varieties that actually has a solid stem, rather than being hollow inside. It’s also a bit more cold resistant than ordinary water bamboo, hardy down to -10º F. Phyllostachys bissetii: Very dense growing, with a thick bushy canopy, and very cold hardy. The one-inch shoots will grown up to about 20 feet in height. Phyllostachys nuda: A very attractive and cold hardy species, its shoots get 1-2 inches in diameter and 25-30 feet in height. Young shoots appear very dark, almost black, turning a rich, dark green as they mature, usually with pretty, white rings around the culm nodes. Phyllostachys atrovaginata: Popularly known as “incense bamboo”, this variety has a waxy coat that gives the culms a very pleasant fragrance in hot weather or when rubbed. Many gardeners appreciate how fast his bamboo grows, with thick culms of 3 inches or more in diameter and up to about 40 feet in height. Good at temperatures as low as -10 or 15º F. Phyllostachys parvifolia: Like water bamboo, the rhizomes of this species are well adapted for wet and saturated soil. Small leaves make the thick, dark green culms stand out, and the white rings around the nodes give them even more character. Fresh shoots of this variety are reputed to be delicious in flavor. Mature shoots can get up to 40 feet tall, and it is cold hardy down to -15º F.
REMEMBER: If you’re planting running bamboo, like any Phyllostachys variety, always use a root barrier. Check out this Deep Root Barrier available from Amazon. Also check out this detailed article on bamboo containment practices. As you can see, there are plenty of bamboos to choose from if you’re looking to landscape an oriental style garden in the northern habitats of the US, Canada or even Europe. Most of these species are hardy into the negative Fahrenheit territory, so as long as you aren’t expecting to dip below minus 20º or something, you should be fine. And even if the leaves get a little fried in an abnormally severe cold snap, the roots should still endure. Have fun gardening, and if you have any photos of snowmen in your bamboo grove, please send them our way! Here at Bambu Batu, we’re just crazy about bamboo. Perhaps you knew that by now. We grow it, we wear it, we eat it, and we read about it. As one of the oldest cultivated plants in human history, you can believe there are quite a few books about bamboo. So your chances of reading every bamboo book are about as good as your chances of visiting every bamboo garden. That’s why we’ve put together this list, a sort of greatest hits compilation from the world of bamboo literature. Yes, you might say we’re a little obsessed. But no, we’re not completely bamboo bonkers. That is, we haven’t read every book about bamboo ever written. We’ve read quite a few though, and sold several titles in the shop. We’ve also spent years researching bamboo and networking in the bamboo industry. There’s no doubt, in fact, that we are authorities on the subject. NOTE: To make shopping easier, we’ve included some affiliate links in this article. Bamboo is an enormous subject, so to get a better handle on it, let’s break the literature down into three distinct topics. And before you order what may be described as the “bible of bamboo”, be sure that it actually covers the topics of bamboo that you’re interested in. For example, if you’re planning to build a bamboo house, and your “bible of bamboo” is actually a phenomenally comprehensive account of bamboo’s anthropological history, then you might be in for a disappointment. Just be sure you know what you’re looking for, and always check the product description or the summary on the back cover before you make a purchase. To make shopping for the right book even easier, we’ve included direct links to Amazon. If you’re planting or maintaining a bamboo garden, be sure your book is about growing bamboo. Plenty of bad book reviews on Amazon come from gardeners who bought books filled with “useless” information about the history of bamboo. 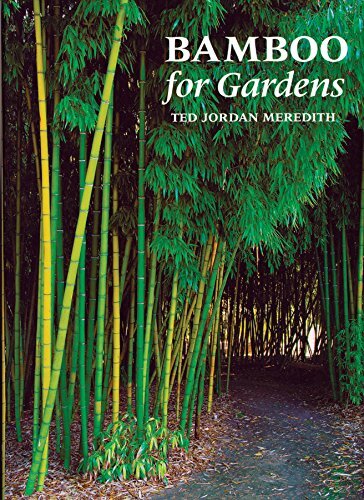 Probably of my number one go-to for bamboo eye candy, this beautiful volume explains the many great reasons for planting bamboo, and then goes about describing how to do so in your own garden to get the very best results. An excellent addition to the coffee table, the book is also rich with encyclopedic, botanical information on selecting, planting and maintaining the best species for your setting. Another very nice looking and extremely informative anthology of bamboos, this beautifully illustrated book covers a couple hundred varieties of the most attractive tropical and subtropical bamboos. Not only fun to look at, but also filled with useful, specific advice for planting and growing. If you’re thinking about growing bamboo on a larger, maybe even an industrial scale, then this is the book for you. Lewis and Miles are positively the North America authorities on large scale bamboo cultivation. An invaluable resource for any bamboo farmer, the book is loaded with practical information on the growing, harvesting and marketing of bamboo for myriad purposes. For the real bamboo enthusiast or scholar, there is an abundance of literature out there on the 7,000-year (give or take) history of bamboo. These sorts of books will typically address the many uses of bamboo over the centuries, from eating to building to paper making. Some are likely to focus on one area more than another. You’ll also find a wealth of mythology and folklore that usually appears alongside bamboo history. More specialized books can also cover those erudite topics. This comprehensive compendium just overflows with fascinating facts, stories and illustrations. Written with exuberant passion, the book covers the history of bamboo and its co-evolution with Asian civilization, exploring the plant’s countless uses in both the past and the present. Here’s yet another handsome volume to prove that bamboo is magnificently photogenic, on top of all its other remarkable traits. One of America’s foremost authorities on bamboo, the author Susanne Lucas is executive director of the World Bamboo Organization and a horticulturalist, designer, and landscape gardener based in Massachusetts. Her book provides a very thorough history of bamboo and its uses by humans over several millennia, while also cataloging the impressive range of innovations and applications in modern times. A subject that’s undergone something of a renaissance in recent years, bamboo construction is fascinating even for the layman, and can get very technical for those actually wanting to build a structure they can comfortably live in. Depending which sub-category you belong to, be sure that the bamboo construction book you buy contains the types of pictures and the level of detail that will be most useful and interesting to you. Considered something like the Master Guru of bamboo construction, no one has done more to demonstrate the incredible building potential of bamboo than Colombian architect Simón Vélez. In Grow Your Own House, Vélez presents a stunning selection of bamboo structures that will change the way you think about bamboo shelter. Contrary to the title, the book only includes a handful of houses, but it’s filled with examples of ingenious construction features that could be used across a variety of applications. This stimulating volume is loaded with useful, practical images and information about bamboo’s uses as a construction material. Featuring a great selection of bamboo structures, the book will inspire you with its broad scope and educate you with its up-close details. This beautifully laid out book showcases an array of bamboo structures in Asia and South America, demonstrating the plant’s ability to measure up favorably against both timber and steel. There are literally hundreds of books about bamboo out there, and these are just a handful of our favorites. If you’re looking for something more specific —whether it’s Building a Bamboo Fly Rod, the secret to Cooking With Your Bamboo Steamer, the exotic elegance of decorating with Bamboo Style, or whatever have in mind — it’s all available. And just when thought you knew all there was to know about bamboo, perhaps you’ll discover a brand new obsession with Japanese Bamboo Basketry. Wherever your bamboo passion takes you, go there with gusto, and maybe some day you’ll be writing a bamboo book of your own. There’s an old saying among seasoned bamboo growers. “The first year it sleeps, the second year it creeps, and the third year it leaps.” Those wanting a quick spreading hedge or grove in their backyard might be disappointed with their new stand of bamboo after the first 6 to 12 months. But it won’t be long before they’re running for their chainsaws and pick axes, desperate to curtail an out-of-control root system. So before you plant that super sustainable renewable grass specimen in your garden, you’ll need to have a clear strategy for bamboo containment. And if it’s already too late, and the clump you planted just two or three years ago is already running amok, then you’ll want to consider some effective methods of bamboo abatement and eradication. Or worse yet, maybe your neighbor went gung-ho a few years back after an inspiring trip to the home and garden show (or a quick glance at this rousing article on best bamboo varieties). And now his short-sighted dream of a Japanese garden is turning into a nightmare of bamboo rhizomes wreaking havoc on your fence line, your flowers beds, your veggie patch and your sprinkler system. In this case, you’ll want to study up on both topics mentioned above, in addition to possibly signing up for a course on non-violent communication. When it comes to time make peace with your neighbor, you’re on your own. But this article will help you with the first two issues, and also prevent you from becoming the kind of gardener whose neighbors want to come after them with a bulldozer in the night. NOTE: This article does contain affiliate links for bamboo gardening products. If you’re planting a fast-growing (read: aggressively spreading) bamboo privacy hedge, or one of the popular and massive timber bamboos, and you live in a neighborhood (as opposed to rural farmland), then a good rhizome barrier is absolutely essential. Here are a couple things you will need to keep in mind. First of all, never underestimate the tenacity of a healthy bamboo plant. Bamboo is a force of nature unlike any other. People like to talk about runners vs. clumpers, but as they mature, all bamboos display the undeniable will to spread out. You can put bamboo into a pot or a barrel, but don’t kid yourself. If there’s a crack in the barrel or a hole in the pot — and surely there is — the bamboo roots will eventually find their way out. And if there’s soil below, the roots will take hold faster than you can say phyllostachys! Also know that those little rhizomes have an amazing ability to sniff out a good water supply, especially in a dry climate like California. That means, if you have some bamboo in the ground, and one of your neighbors has a drip irrigation in their herb garden, or they regularly run their sprinkles to keep the lawn green, it’s very likely that your bamboo will send out runners headed straight for that water source. It’s like the bamboo has a kind of plant ESP. But just wait till those well-watered roots start sprouting up new shoots in the neighbor’s perfect lawn like UFOs (Underground F#@&ing Objects). Don’t expect them to be welcomed with open arms. And don’t think you can just yank those unwanted sprouts from the soil like a handful of pesky dandelions. It’s not unheard of for people to rent a backhoe or a bulldozer to really clear out an established stand of bamboo. Otherwise, count on spending a few hours with a spade, maybe a pick ax, maybe even a Sawzall (reciprocating saw), to keep those running rhizomes at bay. And you’ll need to do that sort of maintenance at least once or twice a year if you really want to keep your bamboo from getting the upper hand. After many centuries of man and bamboo butting heads, and bamboo almost always coming out the winner, some brilliant gardener(s) finally devised a virtually impenetrable system of bamboo containment to help keep your grass where it belongs. Today you can (and should!) buy sheets of extremely durable black polyethylene, about 1.5 mm in thickness, and usually 24″ to 30″ in width. It’s normally available on a roll, anywhere from 25 to 100 feet in length. You might think 24″ is plenty. After all, who wants dig a 3 foot trench all the way around their hedge? But trust me, use at least 30″, you’ll be better off in the long run. Like I said before, never underestimate the perseverance of a bamboo. The most popular, most effective, tried and true bamboo containing material is available online from Amazon. It’s the DeepRoot Bamboo Barrier, 30″ deep by 100 ft roll. This stuff is nearly invincible, going a serious 2.5 feet underground, and the 100-ft roll gives you enough length to contain a pretty major privacy hedge. Consider it a few hundred bucks well spent on your peace of mind and good neighbor relations. Another less expensive alternative to consider is Bamboo Shield’s 24″ by 100 foot roll. Bamboo Shield also offers shorter rolls with deeper coverage to contain the most aggressive bamboo specimens, all available at Amazon. Check out the Bamboo Shield 30″ by 50 foot roll, or the extra heavy duty Bamboo Shield 36″ by 25 foot roll . OK, so it’s already too late. You or your neighbor let some bamboo run free, and now it’s just out of control. Is there an easy way to get rid of it? Well yes, there are ways to get rid of it. But none of them are easy. First you’ll need to cut it down to the ground, as low as possible. And then start digging. Pull out roots and rhizomes as you go. And keep on digging. If it’s a particularly tenacious variety you may want to reach for a pick ax or a hand saw. If nothing else works, or your back just isn’t up for this type of labor, your best best will be the Sawzall. As the name suggests, these things saw through anything. The top of the line piece is Makita’s Cordless Recipro Saw Kit, sold complete with saw blades and an extra battery. Or you could save a few bucks with a similar Dewalt 12 Amp Corded Reciprocating Saw. In any case, don’t let these tools and cautionary tales frighten you out of planting an amazing grove of bamboo. With proper preparation, these incredible products make it possible for even the suburban gardener to plant an astonishing stand that the whole neighborhood can enjoy! After some 10 or 20 thousand years of cultivation, bamboo’s popularity may in fact be at an all-time high. Of course, 10,000 years ago, there were a lot fewer people around to exchange gardening tips. But it’s also true that more and more people today are recognizing bamboo for its utility, versatility, aesthetic beauty, and all-around sense of good joo-joo. Though it’s been revered in the Far East for these same qualities for many thousands of years, it’s taken a few extra centuries for this thing of wonder to reach the west and spread like wildfire — not unlike a few other things I can think of. Yoga and sushi quickly come to mind. As if sorting through the options of bamboo toothbrushes and bamboo towels weren’t challenging enough, consider now that if you’re looking to plant a few varieties of bamboo in your garden, you’ll have between 1-2,000 species to choose from. Even the bamboo specialists can’t agree on the actual number of bamboo breeds. But no need to split hairs over speciation. Today we’d like to help you narrow it down to the 10 best bamboo varieties for your garden. Some people like to say that there are types of bamboo: runners and clumpers. Of course, that’s a sweeping generalization, because, like I said, there are really something like 1-2,000 species of bamboo. Not only that, but there are also slow runners and aggressive clumpers, and a number of other factors that could affect the growth habit of your bamboo. Having said that, this still remains the simplest way to think of bamboos. Most bamboos are runners, meaning that they send out rhizome roots racing underground in pursuit of moisture and elbow room. If you’re looking to plant a privacy hedge that will spread quickly along a fence line, or you just enjoy watching a voracious plant as it wields its dominion over the landscape, then this is the way to go. They also tend to be the easiest to find, especially at non-specialist nurseries, because they do propagate so easily. But be careful, and think before you plant. The old adage about bamboo says that, “The first year they sleep, the second year they creep, and the third year they leap.” In other words, you might not think it’s a runner after the first year, but by the third or forth year, you almost certainly will, and so will your neighbors. Running bamboos have no respect for property lines. If the neighbor to the one side is regularly sprinkling his perfectly manicured lawn, or the neighbor on the other side is constantly irrigating her prize-winning rose bushes, it won’t take long (especially in a dry place like California) for those eager rhizomes to sniff out those delicious water sources and wreak havoc on the roses, the lawn, the vegetable patch, the herb garden, and pretty much everything in sight. There goes the neighborhood! Allow your running bamboo plenty of room to spread. If you’re gardening in a tightly-squeezed suburban subdivision, then you probably will not have plenty of room. If you’re trying to fill out and green up some vacant acreage, then that’s more like it. Keep you bamboo well-contained. There are a number of ways to do this, ranging from a simple solution like planting into a old wine barrel (or half barrel) to burying any manner of rhizome barrier into the ground. Just remember, with time and pressure, there’s almost nothing that stop those roots from spreading. So whatever you put into the ground, plant it thick and deep. (Check out our tips on bamboo containment.) Get your hands dirty and prune your bamboo regularly. That means not only trimming back the shoots, but going underground and cutting back those vigorous roots. Look for smaller and slower running bamboos, like some of the ground cover varieties. But keep an eye on them. Sometimes they look sleepy on the surface, even while the roots are constructing an invisible empire underground. Find some clumping bamboo and plant those instead. The fact is, many of the most interesting and attractive bamboo species are runners. They also tend to be less expensive and easier to find in nurseries. So now that you’ve been warned, here are a few great bamboo varieties to look for. You’ll definitely want to allow some extra space for this tremendous timber bamboo that easily reaches 20 to 50 feet in height, with culms up to 4 or 5 inches in diameter. As you can imagine, it will also have a pretty massive footprint. But for anyone who’s got the space for it, this majestic grass could be a prized specimen and the envy of bamboo enthusiasts all around. I planted one of these in my suburban backyard in San Luis Obispo, and kept it in a 15 gallon pot for fear of it overtaking the neighborhood. After 5 or 6 years it never looked unhealthy, but it sure never reached the kind of stature described above. It really needs room to spread out. Another very impressive variety, its regal appearance has earned this one the nickname of “Temple Bamboo”, which also happens to be FAR easier to pronounce! This bamboo can get to be 20 or 30 feet in height, but its richly colored culms don’t grown much larger than an inch or so in diameter. I also planted one of these in a 15 gallon container, but it didn’t take long to break out and proliferate around the yard. But with such handsome shoots, I just couldn’t bring myself to uproot them. This really is a beautiful species of bamboo. The distinctively dark brown (not quite black) shoots make this one of the most popular strains of bamboo, and any nursery that sells bamboo is likely to have some of this on hand. As the plant matures, the dark color of the culms grows richer, making for a very attractive contrast against the bright green leaves. Also quite popular, arrow bamboo earned its name from its long, strong, straight poles, which Samurai warriors used to make arrows. Today it’s a great choice for planting in shady corners of the garden. Also, though technically classified as a runner, it has a far more restrained growth habit than most bamboos of that class. The broad green leaves make this a very vibrant and attractive specimen. One of the few bamboos that can be cultivated as a ground cover, this one makes an excellent accent alongside larger bamboo varieties, around Japanese pines, and in any sort of Asian themed garden setting. Its compact size also makes it much easier to contain, despite its being a runner. Just keep an eye on those roots! While the most impressive varieties of bamboo tend to be runners, the conscientious gardener is always on the look out for a good breed of clumping bamboo. They might not always display the awesome meter-a-day growth of some fabled bamboos of the tropics, or the massive culms that make you want to reach out your arms for a bear hug, but they can lend an exotic charm to any small scale zen oasis or Japanese garden. Now before you rush over to Home Depot, or your nearest box store discount nursery, and start asking sales clerks for their recommendations on clumping bamboos, keep in mind that very few people — nursery employees included — can reliably distinguish a runner from a clumper. And as long as clumpers remain more expensive, more sought after, and harder to come by, it’s easy to imagine how unreliable certain sales people could be. With that in mind, I’d like to recommend a couple of my favorite bamboo nurseries in California: Bamboo Sourcery in Sebastopol and Bamboo Giant near Santa Cruz. These guys really know their bamboo. But if you want my opinion, here are a few of my favorite clumpers. An old favorite, Oldhamii is said to be the most widely grown variety of bamboo in all of the United States. You might say it’s an old standard. Native to Taiwan, it does have a preference for the tropical climes and is not very cold-hardy. But with shoots reaching up to 60 feet or more (under ideal conditions) and growing up to about 4 inches in diameter, it’s certainly an impressive specimen, particularly for a clumper. You’d have to agree, it’s an oldie but a goodie! With its slender stalks and delicate, wispy leaves, this delightfully compact specimen looks good in nearly any garden. All it needs is a gentle breeze to make it really come alive. It also prefers warmer climates. I grew some in a cool, coastal climate, and it always looked happy; it just never grew very big. With a catchy named derived from the bulbous shape of its internodes, Buddha’s Belly is one of the easiest species to recognize and one of the largest varieties of clumping bamboo. Whatever it lacks in straight and narrow poise, it more than makes up for with portly character. This subtropical variety also does better in the warmer zones. Exquisitely elegant, this variety is easy to recognize with its green and yellow racing stripes. Even amidst a great collection of bamboos, this one is sure to stand out. In ideal conditions, it can get up to 20 feet, and the culms grow to about 1 inch in diameter. The richly colored, powdery blue culms give this bamboo an especially attractive appearance. Indigenous to the mountains of China, it also does better in warmer and subtropical regions. But it grows especially well around ponds and in containers. Culinary tip: fresh shoots of the Himalayan Blue are edible are said to be quite tasty. Anyone for stir fry? Once you’ve finished selecting and planting your bamboo varieties, you might consider adding a bamboo fountain somewhere for an extra dose of zen. I hope you’ve found these suggestions helpful. If you have a favorite bamboo that we were unable to include in this short list, go ahead and let us know in the comments section. Meanwhile, happy gardening! Check it out! DIY Garden presents The Ultimate Beginner’s Guide to Growing Your Own Kale! This superfood boasts deep, earthy flavors that can range from rich and meaty to herbaceous and slightly bitter. And it is easy peasy to grow! Here’s the link. The Ultimate Beginner’s Guide to Growing Your Own Kale! Yes, we got record amounts of rainfall this week, for this time year. But no, the drought is not over. Not by a long shot. We probably used more water wiping the spots off our windshields than we received in the form of rain. Estimates for most parts of SLO County indicate something between one and two thirds of an inch fell on Tuesday, so drought conditions remain as severe as ever, and so there’s no better time than now to get waterwise. If you haven’t already started taking fewer and shorter showers, please do. If you haven’t already removed your fuzzy green lawn, or at least let it whither away by natural causes, then what are you waiting for? These are simple steps we all should’ve taken by now, minor inconveniences to our lazy lifestyles. But there’s plenty more we can do, especially if you’re not enamored with that golden brown front yard of dead sod. Master Gardener Mary Wootten is hosting a workshop on Waterwise Gardening later this month, June 25th, at the Paso Robles demonstration garden to provide creative tips on more efficient and socially responsible gardening strategies. Topics will include drought-tolerant landscaping, grey water recycling, and drip irrigation. With her waterwise words of advice, you can enjoy a beautiful garden without taxing our diminishing water tables. Workshops are free; check out the flier for complete details. What could be a more appropriate use for salvaged wood than use in a recycled greenhouse? Once a thriving organism in its own right, timber rescued from wine barrels, barns, old doors and retaining walls can become a shelter for developing seedlings. A Place to Grow | Recycled Greenhouses recognizes the potential in scrapped wood and bestows upon the material a new life as an environmentally conscious greenhouse, shed, or outdoor studio space. Operated by San Luis Obispo residents Dana and Sean O’Brien, the company prides itself in finding a solution to construction waste and creating beautiful bespoke structures. Dana boasts a finance degree from Cal Poly SLO, over 20 years as a government employee, and an active role in Habitat for Humanity. Sean graduated with a degree in computer science from Cal Poly, has been a software engineer for more than 25 years, and possesses a California contractor’s license. Together, the O’Briens created their business to pursue their passions for eco-friendly building. A Place to Grow has been honored by the Martha Stewart American Made Contest, and has created greenhouses for Sage nursery in Los Osos and private residences up and down the Central Coast. For more information, contact A Place to Grow through their website, or email Dana at dana@recycledgreenhouses.com.